A recent photo of the Point Pleasant River Museum and Learning Center. As I promised on social media, a full history of the Point Pleasant River Museum building. Last week, I wrote on Rev. Graham’s settlement in the Bend Area and told you that following his death, most settlers left, with the exception of the Mitchells. James and Mary Mitchell came to America in 1797 and landed in Philadelphia. During their journey west, they heard of Rev. Graham’s settlement and chose to join him. Mary, though, was with child, and they spent a few months in Pittsburgh before starting the journey downriver. It was there that their son Robert was born. Not much is known of Robert’s early life, though he and his 8 siblings likely did their fair share of work on the family’s farm. Being pious Presbyterians, they likely also attended church services in the Bend. Though, because a Presbyterian congregation was not organized in Mason County until 1834, they likely attended Pastor Paul Henkel’s services at the Roush family homes, and later the “Barn Church” on Broad Run. By 1830, Robert had married Maria Bennett-Thomas, the daughter of Dr. Jesse Bennett (yes, the child born via the famous c-section) and the widow of Dr. Enos Thomas, Dr. Bennett’s partner. In 1849, Enos Thomas’ land at the corner of First and Main was consolidated among his children and widow, ending up with his son Griffith for only $500. Such a low value, particularly for a property nearly right beside the Kanawha River wharf, can only be explained by the fact that nothing was yet built on the property. This had changed by 1856, when Robert Mitchell bought the property back from Griffith for $1,800, nearly four times the price and $53,000 in today’s dollars. That jump in price suggests that between 1850 and 1855, a fairly large building was built on the property. More than likely, Robert had partnered with his step-son to build it, as he was an extremely successful merchant and Griffith was just beginning. That building is still standing today, and it gives much evidence to support its age. The style of the building hints at Gothic Revival, which was popular in America before the Civil War. The building isn’t much larger than a two-story home, for example, Judge English’s home on Main Street or Roseberry Plantation. Architectural historians call this “residential-in-scale,” as commercial buildings got much taller with the engineering improvements that followed the Civil War. The building’s general shape is also unique on Main Street. If you look at the roofline, you’ll see that it is a gable roof that points toward the street. In other words, it is “gable-front.” This construction style died following the Civil War, as it became possible to support a flat roof and use less material. We also know that it wasn’t built after 1856 because of events that followed. Following that purchase, Griffith left the partnership and opened his own mercantile on Front Street. He was replaced by Mitchell’s true son, James. The two were enormously successful, primarily due to their location essentially on the Kanawha wharf. That, unfortunately, did not last long. In 1861, both Robert and James voted in favor of the Ordinance of Secession and became instant pariahs in the very pro-Union community. The business struggled, and that only got worse after James left to join the Confederate Army under General Albert Jenkins. As part of the 8th Virginia Cavalry, he took part in both raids on Point Pleasant in 1862 and ’63. Because of their Confederate ties, the property was also confiscated by the federal government, but soon returned to Griffith. Following Robert’s death in 1864 and Maria’s in 1870, the property was sold to Setzer, Sehon, & McCulloch. Their deed specifies that it includes the “storehouse and adjacent dwelling,” confirming the age of the building. Sehon was Columbus Sehon, the grandson of both Col. Charles Lewis and Major Andrew Waggener. McCulloch was John McCulloch Jr., son of pioneer settler John McCulloch and husband of Delia McCulloch, historian for the Col. Charles Lewis Chapter of the D.A.R. when Tu-Endie-Wei was established and the Monument constructed and later State Historian for the D.A.R. In the years following, it was sold to McCown, Spencer, & Company, then to J.S. Sutphin, then to Hosia Greene Nease & Company, who owned the property until 1948. All continued the mercantile, dry goods and general store, that began with Robert Mitchell and Griffith Thomas in the 1850s and lasted nearly 100 years. Under the 1st company, the business suffered hundreds of dollars of damage in the 1884 flood. Under the 2nd and 3rd, the Ohio River Railroad and Kanawha & Michigan Railroad arrived in town, signaling the end of the steamboat era and the location’s prosperity. Also under the 3rd was, of course, the 1895 fire that destroyed much of the district, of which the River Museum building is one of the only survivors, as well as the 1913 and ’37 floods. Finally, in 1948 the building was sold to the Hartley family, who owned it until 1990 when they donated it to the City for the creation of the Point Pleasant River Museum. Information primarily from the US Census, deeds on record at the Mason County Courthouse, and the Weekly Register. 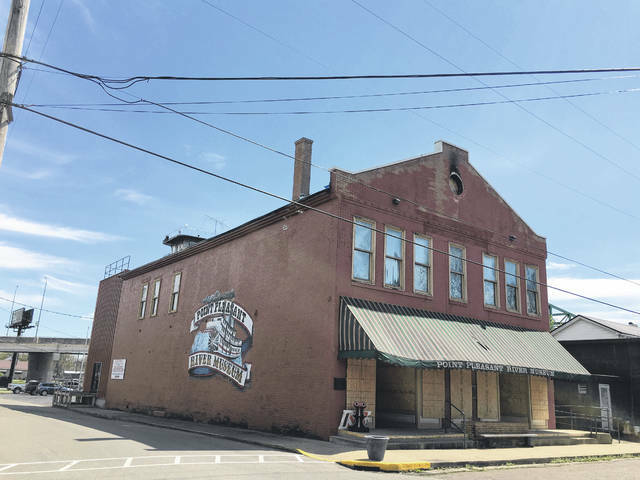 The Historic Landmark Commission meeting to determine the fate of the building will be April 24 at 5 p.m. at the Point Pleasant Municipal Building.